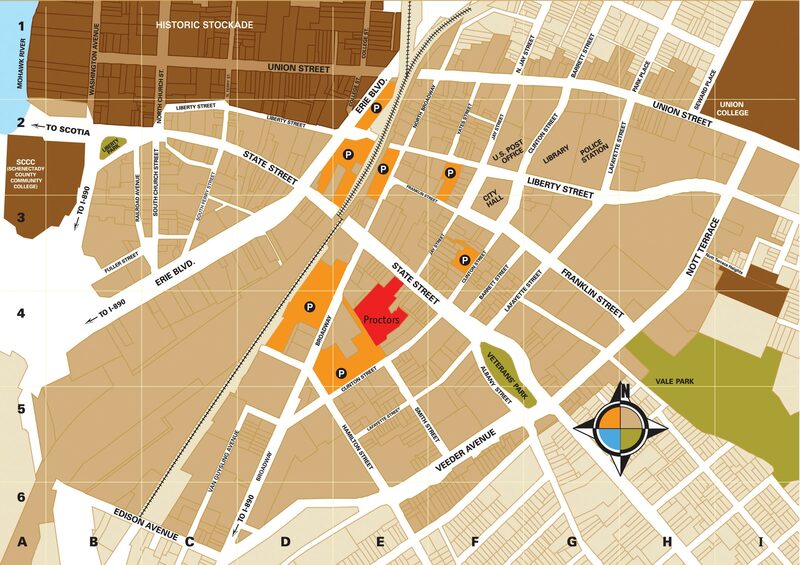 On this map, you can the downtown Schenectady parking areas highlighted in yellow, and marked with “(P)”. Proctors is location (1), highlighted in red, right in the middle of the map (E4). Your best bet is the Parking Garage, off Broadway (cell D4 on the map). Parking in the Broadway garage is free for all Council attendees, all weekend. If you leave before 5:00 PM, an attendant will be at the booth. If you’re staying at the Hampton Inn, they have a private lot for their guests. That’s the best option for you. The Hampton Inn is also in cell E4. If you're staying at the Parker Inn, they have a part of the Clinton Street parking lot set aside for their guests. There are no major shows at Proctors this weekend, so there should be plenty of spots in the Broadway garage. There will probably be unattended parking spots in the Clinton Street lot, behind Proctors, as well. But we cannot guarantee this. If you need to unload a lot of stuff for your game (like for GMs running a miniatures game), there are access doors directly off the convention area. Park temporarily, come to the registration desk, and we’ll help get you situated.